I'm confused. I knew about a live-action Ao Oni film, but apparently this isn't it. That film was from 2014, whereas the internet thinks this is a sequel/reboot/something from the following year. Nothing about what I watched suggests "sequel", though, and I'd simply assumed that this was a short, cheap and not very good Ao Oni adaptation. I presume there's no connection. More importantly, there's also little reason to watch it. 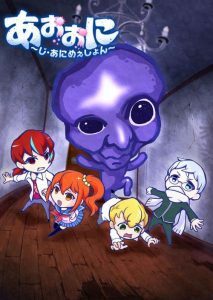 The teens are the usual Ao Oni protagonists, i.e. Hiroshi, Takuro, Takeshi and Mika. There are two other teens too, but they don't enter the house. Mika and Hiroshi are forgettable. Takuro is really annoying, although in fairness: (a) the film will soon acknowledge his hate figure status by having him do something cowardly, and (b) there will be character development. Takeshi probably gets the most interesting material, actually, although unfortunately it doesn't really get any payoff. There's a blue ghost. How? Why? What does it mean? No idea. It's just there. It's spooky, yes, but it doesn't have any effect on the story. However there's also Fuwatty, aka. Blockman in English. Fuwatty rules. Cute little Fuwatty will run towards you as fast as it can, gnashing its many teeth, but then charge past you, hit the wall and fall over. He's a fun cameo... until he turns out to be slightly more. Fuwatty is a minor part of this movie and he's not in it very long, but for my money he's clearly the best thing in it. There's just not much here. The film's sort of vaguely okay, at best, if you're looking for something uninspiring in low-budget horror. Personally I think it's an episode (and not even an hour-long one either). You could make a decent 25-minute anime episode out of this. It has some ideas. It has an entertaining last quickie scene in the end credits. It has characterisation and a storyline. It's just that they're too thin to carry even a 70-minute film, especially one with modest production values and "just get it in the can" direction. It's cheap horror. There are thousands of those. I can't see much reason to choose this particular example. It's not bad enough to get you cheering for the monsters, but it's not a million miles away from that either.